February 7, 2015 (Ulson Gunnar - NEO) Who's surprised? Various stories had been invented by media houses across the Western world in an attempt to explain why oil prices have conveniently fallen, just in time to pressure Russia, Venezuela and Iran, and all while covert political subversion, attempts to sell all-out-war and other measures have completely failed to assert US interests around the world. The obvious answer was market manipulation, an answer US and other Western news sources refused to admit ... that is until now. The New York Times in their article, "Saudi Oil Is Seen as Lever to Pry Russian Support From Syria’s Assad," finally admits, "Saudi Arabia has been trying to pressure President Vladimir V. Putin of Russia to abandon his support for President Bashar al-Assad of Syria, using its dominance of the global oil markets at a time when the Russian government is reeling from the effects of plummeting oil prices. " But of course, despite this grain of truth, Saudi Arabia didn't do this on their own, since Saudi Arabia isn't destabilizing Syria on its own, or for its own interests. Saudi Arabia, while playing a significant part in the manipulation of global oil prices, is solely blamed for the purpose of compartmentalizing public perception. The reality is that global oil prices are being manipulated at the behest of the US not only to overthrow the government of Syria or pressure Iran, but to strike at Russia itself. The New York Times would have us believe that Saudi Arabia is rigging international oil prices to "bring peace in Syria," making no mention of Saudi Arabia's role in backing heavily armed militants streaming into the country turning it into a war zone to begin with. The NYT also makes no mention of the prospect of peace that might result should Saudi Arabia stop its immense state-sponsorship of international terrorism. For the "cause of peace," Saudi Arabia is already estimated to have lost $39 billion. For a regime that chops the heads off its political opponents in public demonstrations meant to inspire medieval fear among its people, the idea that it is willing to lose billions in oil revenue to "promote peace" in Syria is plainly absurd, and raises serious questions about the legitimacy of the NYT. The New York Times would also mention Crimea's return to Russia, but would stop short of linking oil market manipulation to the conflict in Ukraine. However, this is actually the key to understanding global geopolitics and how dropping oil prices fit in. Syria and Ukraine are linked, and Saudi Arabia's role in putting pressure on Russia for one that matters a little to Riyadh (Syria), and another that matters not at all (Ukraine), shows how Riyadh's foreign policy is driven not by national interests, but by obligations it apparently owes to Washington and London (significant obligations that if not met would end with the dissolution of the House of Saud). Other news agencies who helped invent explanations regarding dropping oil prices, included the Washington Post which claimed in its article, "Falling oil prices put pressure on Russia, Iran and Venezuela," that, "THE SILVER lining in the recent financial market turbulence has been the continued decline in the price of oil, which is down about 25 percent since June. In addition to creating a windfall for U.S. consumers — one analysis reckoned the savings could amount to $600 per household — the drop, if sustained, will place considerable pressure on three problematic petrostates: Russia, Iran and Venezuela. The aggressively anti-American foreign policies pursued by all three countries in recent years have been financed in large part by soaring oil revenue." Silver lining? Or concerted conspiracy? The NYT provides the light shining through the Washington Post's cloudy analysis, confirming indeed it is a concerted conspiracy. What does this say about global energy markets and their intertwining with various other sociopolitical issues including the debate over climate change, spikes in prices that strangulate development globally and wars waged for "humanitarian reasons" against nations that just so happen to export oil outside of markets controlled by Washington and London? It says a lot, and illustrates that many of the facades and social crusades well-meaning people have taken up leave them carrying water for one of the most perverse, destructive industries on Earth, in human history ... big oil. 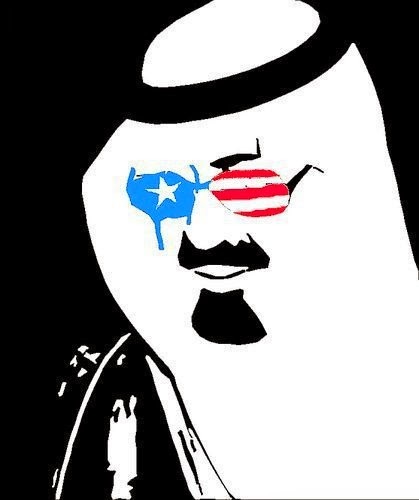 The Saudis wouldn't last long without both internal and external security and support both military and political, provided by the US and others to prop up the otherwise politically and morally bankrupt petrostate. Despite exercising barbarism as a matter of national policy not seen in other countries since the dark ages, its head of state was given passionate eulogies by Western dignitaries as he passed away, with London going as far as flying its national flag at half-mast for the deceased monarch. Taking this to its logical conclusion, the US and its large collection of client states around the world, are undermining Syria, waging economic war against Russia, destabilizing China at home while chasing their investors out of any nation they're found in, not based on some moral imperative, but specifically because of the absolute, utter lack of morality. Understanding this cuts through the various invented stories constantly emanating from the Western media, including myths about miraculously dropping oil prices and their "serendipitous" and "coincidental" impact they just so happen to have on all of America's perceived enemies. Even the Washington Post admits there really is no tie between Venezuela, Iran and Russia, except claims that each is "autocratic" and "anti-American." The real common denominator is their respective resistance to US hegemony in their regions of the world. And while many reasons were invented to explain the convenient drop in oil prices, we can see once again that when events unfold the first question to be asked in identifying the perpetrators is "to whose benefit?" Had the Washington Post fulfilled their duty as journalists and asked this question, readers around the world would not have waited months to finally learn the truth behind dropping oil prices. The answer was simple but ridiculed as "Kremlin propaganda" at the time, but of course, is now fully admitted to to be machinations carried out by Russia's enemies. Lesson learned? Hopefully the next turn in economic fortune in the markets, or terrorist act carried out that "just so happens" to benefit the US and its partners around the world, people will hold those who stand to benefit the most with increased scrutiny and suspicion.